The internet is full of tools to make the life of a Bomber Command researcher easier. There are forums to connect like-minded folk from across the globe. There is the National Archives of Australia website to view digital copies of original personnel and casualty files (among many many thousands of others). And there is Google Earth, which has for me proven invaluable in giving some sort of an appreciation of the geographical setting of the events I’m investigating from the other side of the world. I made heavy use of the program while I was researching and writing my 467 Postblog series over the last couple of years. I pulled the approximate routes flown by the bomber streams on various operations from either logbooks or the Night Raid Reports, then stuck those ubiquitous virtual yellow pins into the map. Then I could plot the locations of casualties, nightfighter attacks or other interesting events in relation to the nominal track flown by the bombers. I could even, in some cases, locate the exact aiming point and trace the unfolding bombing operation in close detail. As an example, take the Tours raid of 10 April 1944 (on which the crew of B for Baker did not take part). I wanted to find potential reasons for why the second wave of the attack was not as accurate as the first had been. I started with the Night Raid Report, which says that “the first red spot fires fell near the roundhouse and the bottleneck between the two yards”. 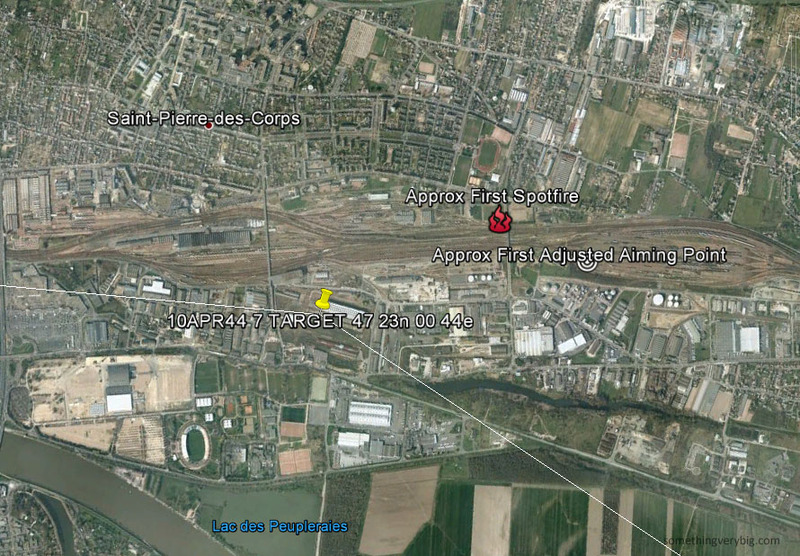 Off to Google Earth I went, where it was easy to find railway yards at Tours with a bottleneck between them and (though this image is quite low-resolution) a roundhouse visible just under the ’o’ in ‘Approx’. Excellent, I thought, and inserted a fire icon. What next? “The Master Bomber therefore ordered crews to bomb 500 yards to the E”, continued the Night Raid Report. So I picked an appropriate icon (a bullseye), and placed it some 500 yards east of the spot fire icon. It’s pretty close to the bottleneck – smash that and the entire marshalling yard complex will struggle to function effectively. So things are beginning to make sense. The bombers approached the target roughly along the line from bottom right to the target pin (which is probably slightly displaced from the actual aiming point because of limits in the resolution of the coordinate system used by the aircrews). This image has been rotated slightly towards the east to fit the text in comfortably so the line of approach should actually be only slightly north of west. While most crews were carrying high explosives only, the 463 and 467 Squadron Operational Record Books reveal that a number of crews also dropped incendiaries, the fires from which caused a lot of smoke to rise over the target. The ground wind, according to Wing Commander Willie Tait’s report on the 467 Squadron ORB, was coming from the west. One look at the target area on Google Earth reveals that the smoke would have been blown back along the path of the second wave of approaching bombers. It’s easy to see why the second wave had trouble identifying the target and thus, one reason for why their attack was not as accurate as the first had been. This analysis came from a careful study of the data found in the Night Raid Reports and the 463 and 467 Squadrons Operational Record Books, combined with a Google Earth satellite view of the target area as it was in 2010. Perhaps a map of the area may have afforded a similar conclusion but it’s unlikely that the detail of the bottleneck and the roundhouse, which stick out clearly on the satellite photo, would have been on a map. I used a similar technique throughout the Postblog series, including tracing Phil Smith’s evasion as he walked south through France – I could even pinpoint the farmhouse where he spent a couple of nights in Orchies two days after his aeroplane crashed. I visited the UK in 2009 on what was essentially a pilgrimage around various sites associated with the crew of B for Baker and with Bomber Command in general. However much they have changed in the intervening decades, there is nothing quite like seeing first-hand places I had, to that point, only read about in logbooks and diaries. But, when trying to trace these events from the other side of the world, if you can’t be there in person Google Earth comes closest for giving an impression of how everything fitted together. As part of the developing strategy to disrupt the movement of German troops and equipment around the planned invasion areas, Bomber Command tonight turned its attention to the small town of Aulnoye, in northern France. In the north-eastern corner of the built-up area in that town was a large railway marshalling yard, and tonight depriving the occupying forces of the use of that facility would be the objective of almost two hundred aircraft. Ten of them – five from each squadron – were from RAF Waddington. Being a French target, this was not expected to be defended with as much vigour as a normal German city might. “All crews on seeing the programme sensed an easy trip and all wanted to go,” says the Operational Record Book for 467 Squadron. But precisely because it was supposed to be an easy trip, the crews chosen to go from Waddington were all relatively inexperienced. The crew of B for Baker were among those who were given the night off. And it turned out, indeed, to be a not particularly challenging operation. “Could do with more of these trips,” quipped Flying Officer Lindsay Giddings. The forecast winds were slightly off, forcing some crews to orbit outbound at the English coast to lose time for the relatively short transit across the Channel, but otherwise no troubles were encountered. The route was quiet and the bombers arrived over the target to find a concentrated collection of target indicators burning in a thin layer of ground haze and almost all of the Waddington crews had the satisfaction of seeing their bombs bursting on or very close to the markers. Many also reported several large explosions in the target area up to an hour into the homeward journey. “If the markers were dropped correctly, the attack will be very successful,” said Flying Officer Dudley Ward. The bombers flew home with a sense of a job well done. “Shouldn’t be much left of the target,” reads the 467 Squadron Operational Record Book the next day. Unfortunately the ground haze reduced visual detail to the point where it concealed the real story. The marking aircraft had been a small force of Mosquitos and, while Oboe worked perfectly, the markers actually fell just a little wide of the target, perhaps pushed away by the wind. The haze made it difficult to visually identify the aiming point itself so the main force could only trust that the Pathfinders were on the money. They faithfully followed the markers and as a result their bombs mostly fell wide also. It wasn’t quite the ‘wizard prang’ that the crews believed it had been, though the marshalling yards still received numerous hits. Other operations that took place tonight included a small force of Lancasters that returned to the aircraft factory at Lyons, adding to the severe damage they caused there two nights ago. Mosquitos kept up the harassing raids on Berlin and made a precision attack on a railway bridge at Hamm in north-west Germany. The usual groups of aircraft dropped mines, scattered leaflets or made Serrate patrols. The only loss from the evening’s operations was one of the Serrate Mosquitos which failed to return.